Although it's unchanged for 2014, the Nissan Murano still stands out among crossover SUVs with its sporty looks and the powertrain employed beneath its curvaceous skin - a standard V6 engine and continuously variable transmission. The Murano's creature comforts and engaging driving manners are also highlights, but the convertible CrossCabriolet version continues to baffle buyers. Have had a lot of cars but this car is truly the car for reliability. No problems. It has taken us on trips and is great on gas. Very easy and comfortable to drive. It runs so quiet we have left it on when we went to eat, when we were done and came out saw radio light was on then realized it was still running. We have had it for 3 years and nothing serious has been wrong. We got flat tire is about it. We have drove off-road for a eight mile drive and no problems. It is nice it is all wheel drive don't have to worry where we drive it because it goes on any kind of road. We have drove high in the mountains and never cuts out and transmission gets us up in high altitude easy. Glad to say it is a great car for anyone who goes on trips in mountains or just to travel in. It has plenty of room to lay back and sleep and good size when taking your pets with you. There is plenty of room when your buying big items doesn't look like a lot but there is plenty of room. We are very happy with this SUV and we don't worry when we go on trips we know it will get us there. We have even slept in the front bucket seats they lay back far enough you don't feel cramped. They come with a lot of good features, air and heat vents for back seat radio is very nice sound, easy to put down back seat only one lever. The gas mileage is great and the air is the best we live in Vegas and need great air conditioning and never gets engine overheated. Just love this car. . . 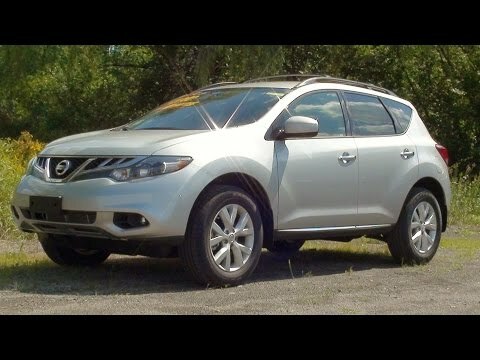 I purchased this Nissan Murano used as 2014 with only 23,000 miles and within my price range. I relied on many reviews and am satisfied with the dependability of this car. This car is smaller than my previous minivan but I had wanted to down size. This car has been very dependable and runs like its brand new. My neighbor had the same car and didn't need any repairs until car was over 100,000 miles. I am satisfied and would recommend this car to anyone seeking a dependable vehicle . Comfortable with lots of amenities. I love the size, not too big, not too small. The features such as back-up camera, GPS, Sirius radio, heated seats are great, as well as the ease of folding the back seats down and putting them back up. The brakes are a bit touchy and take some getting used to. My biggest complaint is the paint. For some reason this vehicle shows scratches and dings much more than any other vehicle I have owned. It's very comfortable and easy to drive.